During past few years composite materials have been gradually developed and spread in numerous fields of Industry. From the beginning composites were created as materials with specials features for aeronautical and military fields, but now they are widely spread in a number of civil applications such as automotive, marine, wind energy, construction, water treatment and many others. 12th Exhibition „Composite-Expo“ is a unique exhibition event in Russia and is a platform for development and introduction of composite technologies and materials in different branches of industry. Many Russian and foreign companies participate in the event such as Technologiya ONPP, RT-Khimkompozit, Stupino Glass Reinforced Plastics Plant, Akzo Nobel N.V., Evonik, OCV Steklovolokno (OCV Reinforcements) are already exhibitors of the event. JEC World in Paris is the only trade show that unites the global composite industry: an indication of the industry’s commitment to an international platform where users can find a full spectrum of processes, new materials, and composite solutions. The event will take place on 12-14 March 2019, in Paris Nord Villepinte, France. 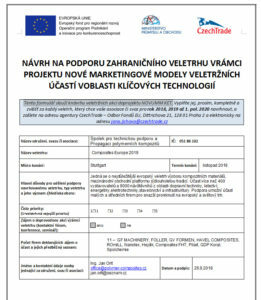 The prioritized placement period for TURK KOMPOZIT 2019, granted for the participants of the previous event, is concluded as of 31 December, 2018. From 2 January, 2019 on, the whole event hall is available for reservation by any participant, old as well as new. The firms which need an exhibition area can register by depositing 50% of the amount required, for the available exhibition areas shown on the attached layout plan. The members are provided a discount of 20% over the grand total. Moreover, the participants which deposit 50% of the exhibition area registration fee by 1 February, 2019 shall be entitled to a further 10% early deposit discount. 1\ Raw materials and related equipment: resins (epoxy, unsaturated polyester, vinyl, phenolic, etc. ), reinforcement (glass, carbon, aramid, basalt, polyethylene, natural, etc. ), adhesives, additives, fillers, pigment, pregreg, etc., and all related production and process equipment. 2\ Composites manufacturing processes and related equipment: spray, filament winding, mould compression, injection, pultrusion, RTM, LFT, Vacuum infusion, autoclave, OOA, AFP process and related equipment; honeycomb, foam core, sandwich structure process and related equipment. 3\ Finished Parts and Application: applied in Aerospace, Automotive, Marine, Energy/Electricity, Electronics, Construction, Transportation, Defense, Mechanics, Sport/Leisure, Agriculture, etc. 4\ Quality control and inspection: NDE and other inspection systems, robots and other automation systems. 5\ Composites recycling, repairing, energy saving and environment protection technology, process and equipment. 6\ Other high performance composites: metal matrix composites, ceramic matrix composites, wood-plastic composites and related raw materials, finished parts and equipment. The trade association Composites Germany organizes the 4th International Composites Congress (ICC) which will take place in Stuttgart – from 05 – 06 November 2018. This Composites Germany Congress is a unique event and all areas of the composites industry will receive equal attention. CIMTEC 2018 – 14th International Conference on Modern Materials and Technologies – will be held in Perugia, Italy, June 4 to 14, 2018. CIMTEC 2018 will consist of the 14th International Ceramics Congress (June 4-8) and of the 8th Forum on New Materials (June 10-14), each of them including a number of Symposia, Special Sessions, and Conferences. As a major longstanding event for the international materials community, CIMTEC will again gather together a large and qualified audience of materials scientists, physicists, chemists and engineers and of experts of a wide range of the most demanding application areas of modern materials, from the molecular and nanoscales to large complex integrated systems. The National Research Council of Italy (CNR), the Italian National Agency for New Technology, Energy and the Environment (ENEA) will act as major endorsers of CIMTEC 2018 together with the World Academy of Ceramics (WAC), The International Ceramic Federation (ICF) and the International Union of the Materials Research Societies (IUMRS). International Conference and Scientific School for Young Scientists, Functional nanomaterials and high-purity substances traditionally organized every two years already for the fifth time, is a major international scientific forum, which covers fundamentals of designing functional nanomaterials, including metallic, high-purity, ceramic, polymeric and composite ones, technological basis for creation of nanomaterials, problems of analysis, assessment of functional nanomaterials and their applications, as well as innovative technologies for preparation and plastic working of inorganic materials. The Conference has high international reputation. In addition to presentations of well-known scientists, section presentations, school-conference for young scientists, as well as extensive poster sessions and round-table discussions, there will be held during the conference, where participants will discuss promising projects in the field of development of novel functional nanomaterials and efficiency of their application. The Conference aims are to attract the attention of organizations interested in the development and modernization of their enterprises via the use of innovative developments of research institutions, as well as to attract the attention of investors, who are interested in effective commercial use of innovative scientific developments. In framework of the VII International Conference „Functional nanomaterials and high-purity substances“, it will be held the School-Conference for Young Scientists. and to promote contacts for projects, papers and exchange of students and staff. Composite Structures, details will be given during the conference.